Based in Wales, Mike combines his passion for photography with expeditions to wild and remote locations around the world. He has visited over 50 countries, with many more still on his wish list! 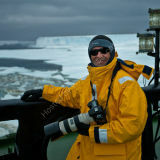 Focussing mainly on landscapes and wildlife, Mike seeks to capture images that convey both the beauty and fragility of the natural world - particularly in the Antarctic, where the effects of global warming are becoming increasingly evident. Mike has over 25 years experience in landscape and wildlife photography, and currently uses lenses ranging from 8mm to 400mm. Mike shoots with Canon DSLRs and uses only minimal post-processing in Lightroom and Photoshop, aiming to 'get it right' in camera as far as possible.